Puppies are susceptible to Parvo in the small window of time before they receive all their vaccinations. For that reason, when puppies from Guide Dogs for the Blind are that age, their raisers carry them when they are in public areas. 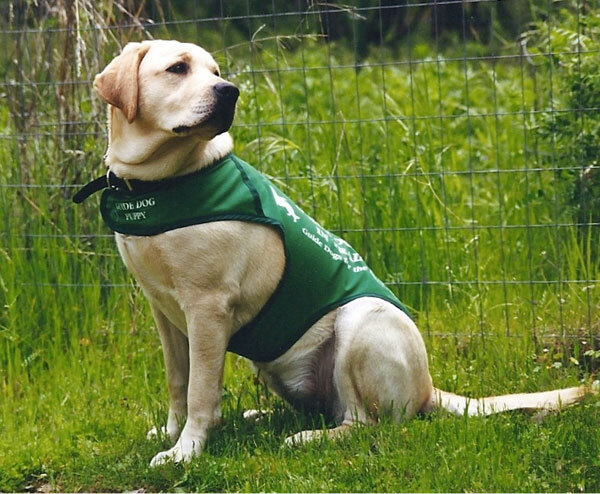 Puppies from Guide Dogs for the Blind wear bright green jackets that identify them as guide dog puppies in training. 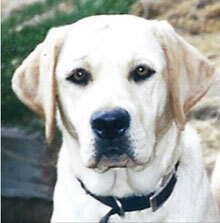 This story is from puppy raiser Patty Sambrillo of Lower Lake, CA. Of course, I did fess up about this to the person, explaining that Joette was a puppy in training. I wouldn’t intentionally leave someone with the wrong impression. I still have Jo, as we call her. She was career changed within two weeks of being returned for training due to cataracts. As we all agreed, we couldn’t have the blind leading the blind. Her eyes are still in good shape, minor cataracts. She is 10 now. But GDB wouldn’t chance training her and then having to pull her if her eyes suddenly got worse. That was great for me as she was the first puppy we raised and I fell so in love. I cried and cried when I got notice to return her. I cried for a month. Just beyond normal. I didn’t realize how hard it was going to be to actually turn her back in. I even had two dogs of my own already. I thought that would make it easier to raise a GDB puppy and give it back. Maybe it was a mistake to pick her up on my birthday—a cute chubby, wrinkled, yellow lab with the cutest root-beer-colored eyes ever! I have raised 8 puppies since then, and I still cry every time I return them. One thing you can be sure of, they have been totally loved! Five of the puppies Patty raised have graduated. Two were returned to her—Jo, with her cataracts, and Higgins with allergies. Brendan, who was fearful of men ”acting strange” and was nervous around children went to a friend of his co-raiser. Patty is currently raising her ninth puppy.